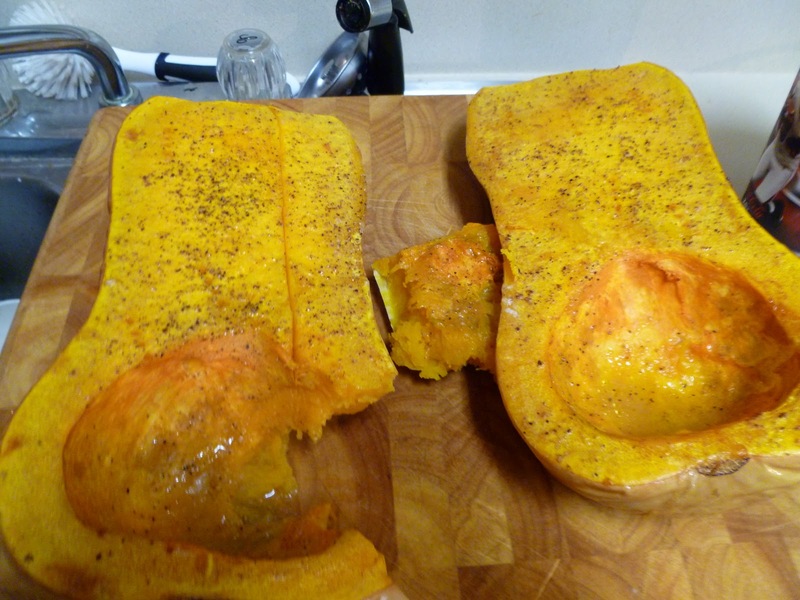 Last week I had a giant butternut squash that my Mom had brought me from the Farmers’ markets. I just cut it in half, drizzled with olive oil and sprinkled with salt, pepper and garlic powder and roasted it at 400 degrees for about 45 minutes. After it was cool enough to handle I cut it into chunks and ate it along with a steak for a delicious dinner. It was so good, but I had so much left over. 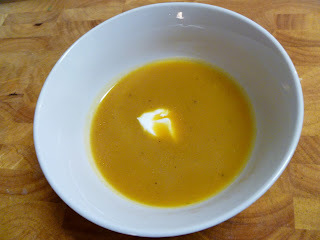 After eating squash for lunch 3 days in a row…this weekend I still had about 3 cups of cubed squash left so I put together this soup, it made the house smell awesome and it was so creamy and delicious, just perfect to sit on the couch and eat while watching football. It made about 8 servings so you could serve it to a crowd or a make it for just 2 and enjoy the leftovers; it will freeze really well. 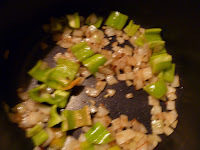 Heat olive oil in a large pot or dutch oven over medium-high, add the onion and pepper and cook until the onion is translucent, 7-10 minutes. 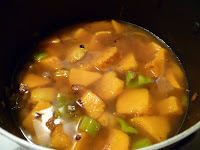 Add the squash to the pan and cook until warmed through, and season everything with salt, pepper and a pinch of nutmeg. Carefully pour the chicken stock in the pan, ensuring the liquid covers all the vegetables, if it doesn’t add water or more stock to make up the difference. Throw the bay leaf in the pan, let it come to a boil, then reduce heat to low cover and let simmer for 45 minutes to an hour. Using an emersion blender puree the mixture until it is a smooth soup, you may have to add more liquid if it is thick. You can also use a food processer or traditional blender for this. Ladle into bowls and top with a bit of sour cream or crème fresh. *This will be half of a large squash or a whole small one. Just cut it in half, pull out the seeds, cover with olive oil, salt and pepper and bake at 400 for about 45 minutes.